I want to share with you (who ever you are!) the things that have helped me survive my past few days in “The Field”. I owe them my health and sanity! For anyone who missed my last post, I have escaped the office and have been let out into the woods to play, collecting data on small mammals (mice!)! 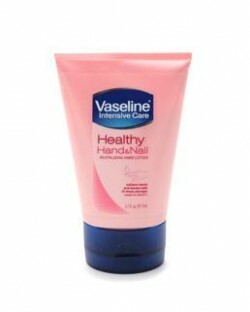 Wonderful hand cream – especially amazing when it’s very cold outside! 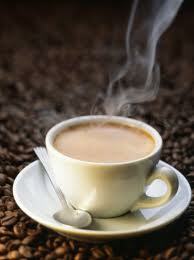 Coffee, tea, cuppa soup, anything warm makes my day seem shorter and brighter! 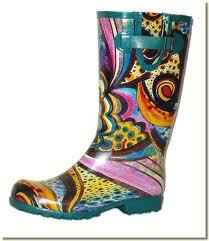 Wellies – Ok mine aren’t as colorful as these beauties, but they keep my feet warm and dry AND I don’t have to worry about laces!!! 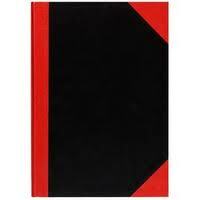 My small field notebook (looks like this one!) It may seem simple, but it saves the hassle of large data sheets and easily fits in my pocket! No, I don’t have one of these in my pocket, but “The Field” is close to an airport and I enjoy watching the planes swoop down over me and my mice every now and then! This week I started a new job, which involved a temporary relocation to an old hunting castle. 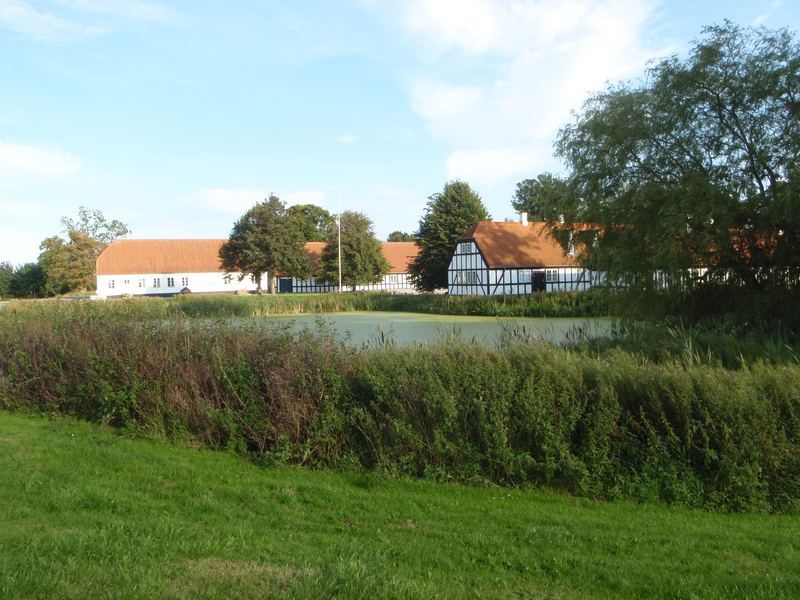 I spent 3 days working in offices located at the edge of one of Denmark’s national parks – Mols Bjerge. 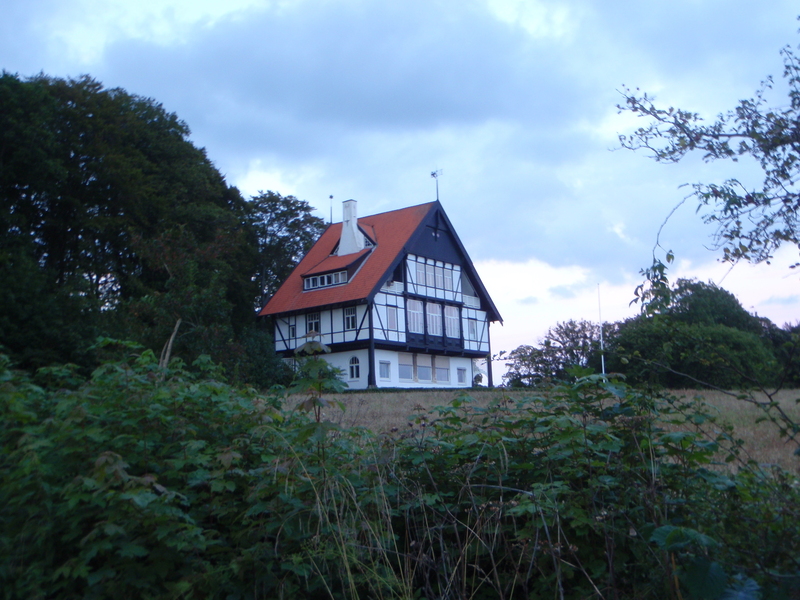 The offices of the Department of Biosciences (Aarhus University) are located in a group of old farm buildings which have been renovated, and guests stay in the attached hunting castle. Kalø Gods – not a bad office location if I do say so! During the day I was busy with an EU cormorant survey project which is being coordinated from Denmark. I am responsibly for collecting information on breeding numbers and communicating this through a central website. It’s an exciting project and I’m really glad to be involved. In the evening, it was easy to escape from the office. Literally on the door step lies the edge of the national park. There are two large forests directly south, linked by excellent trails. I made the most out of the evenings and went exploring until my appetite urged me to come back to make dinner. The old hunting castle at twilight, my home for a few days! 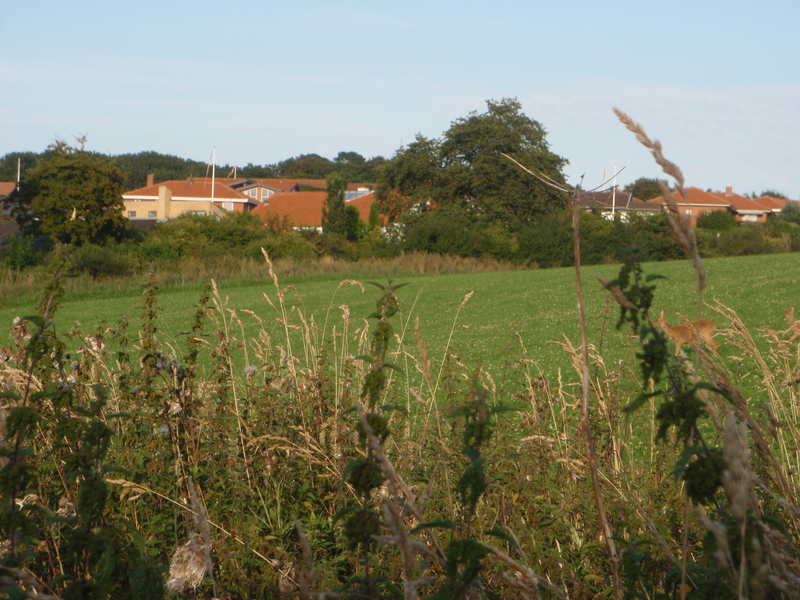 On the first evening, I took a trip to the local village of Rønde to pick up some groceries. Afterwards I decided to take my newly purchased goods for a wander through the woods. I followed my nose south-west towards the coast and reached a point with a lovely view out over the bay. I had forgotten how much I love to be by the sea. With my stomach grumbling I followed a trail along the edge of a field towards the forest. As I walked along I managed to disturb two roe deer feeding. I hunched down and watched for a moment. One of the deer was very unstable on his feet. He stood for a moment and I realised he was missing one of his front legs. Amazing. If you look closely, you can see the “stub”. There are two deer in the picture on the right hand side, at the top of the grass. It’s the deer on the left that is missing a leg (front left leg in this picture). On my way through the forest I met quite a selection of natures wild and wonderful creatures. 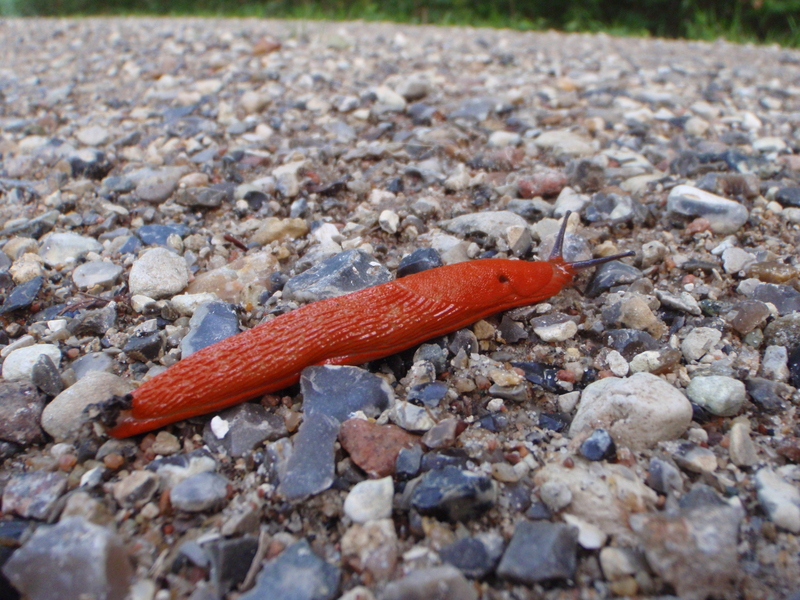 Firstly I was astounded by the number and colour of these large orange slugs. They were everywhere and beautiful! I was also lucky enough to come across a red squirrel chowing down on some recently dropped hazel nuts. I attempted a photo, but it’s not worth showing! Also on mammals, I had a memorable encounter with a red backed vole (rødmus). 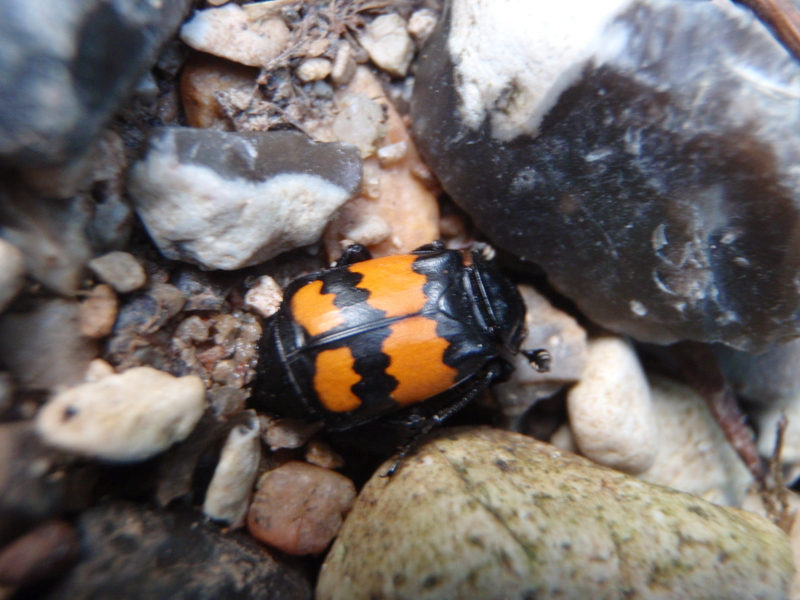 I had stopped to take a picture of an interesting black and yellow beetle (below) and the vole popped out of the long grass at the edge of the path, calmly came over to have a look at me and wandered off again. Very enjoyable indeed! 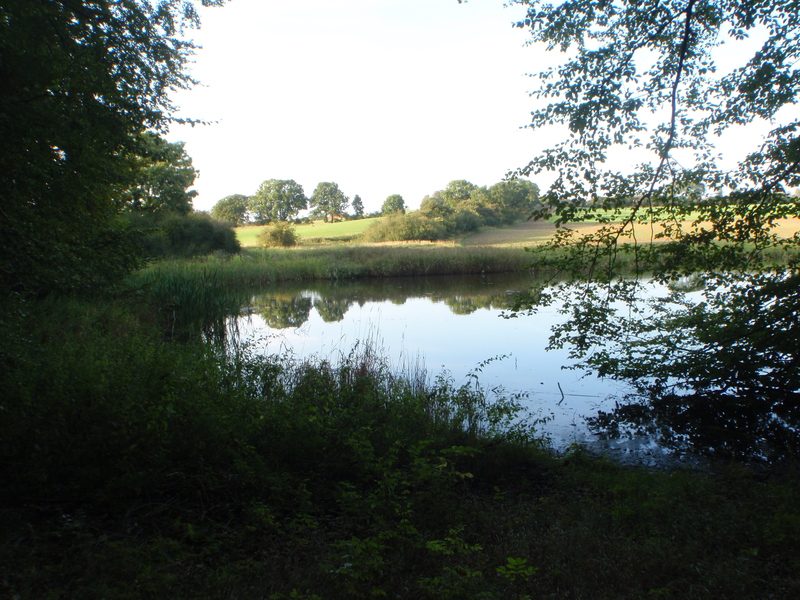 The forests are complete with small natural ponds with a few dragon flies still buzzing about at this time of year. I was amazed at how still the forest was. I expected all the locals to be out enjoying the fantastic natural surrounds, and the wonderful late summer sunshine. But thankfully I had the place to myself, a real treat! On my second evening I took a wander through the forest to the coast to the ruins of another castle (Kaløslot). 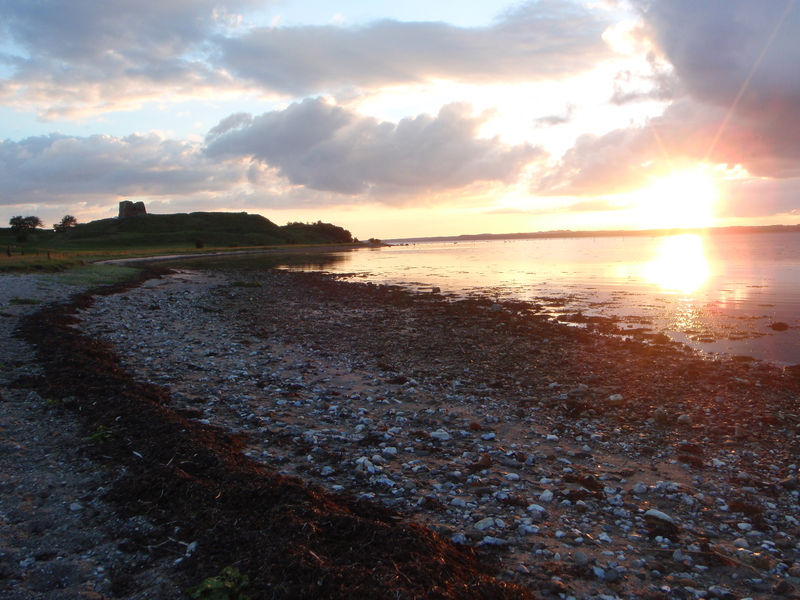 The castle is located on a small narrow peninsula which extends out into the bay. Here the locals and tourists with strange accents gathered to make the most of the sunny evening. I sat on the wall of the castle for a few moments to gather my thoughts (and watch a group of cormorants drying out on some old fishing poles) and felt very much at home. 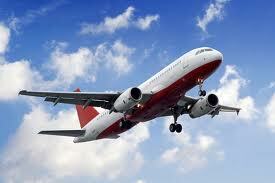 Both in Denmark and with my new job. With the sun setting it was back through the forest to the castle to rest my tired body and exhausted brain for the night. Not a bad start to a new job and a new chapter in my life. 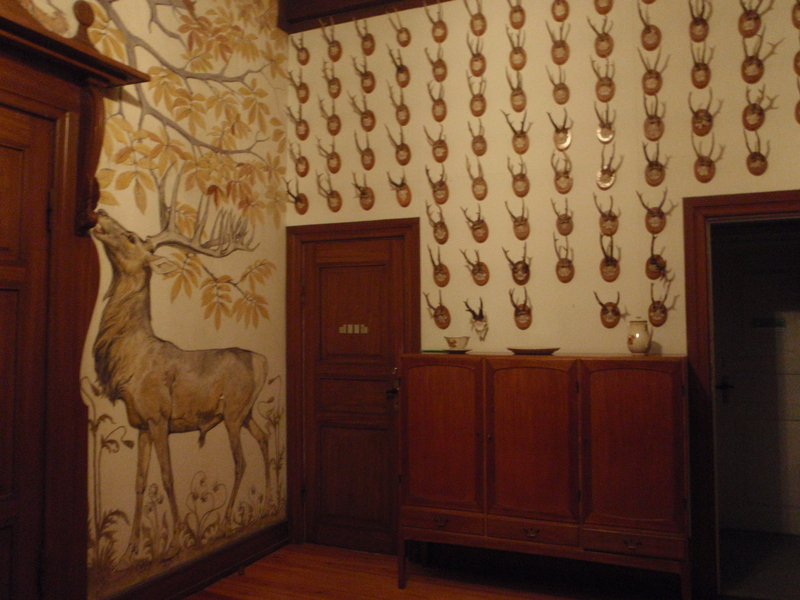 The door to my room in the castle, complete with deer skull collection and artwork!